This Sunday tens of thousands of people will take part in the largest half marathon in the world. Now in its 36th year, the Great North Run kicks off in Newcastle and ends on the seafront at South Shields, taking in a number of historical landmarks along the way. Starting on Claremont Road, the Great North Run takes in Exhibition Park, which got its name from a history of showcasing local industry. In 1887 it was the site of the Royal Mining Engineering Jubilee Exhibition, part of a wider celebration for the Golden Jubilee of Queen Victoria. It drew over 2 million visitors, with exhibits including gardens, a theatre, art galleries and photography. The only remnant from the Jubilee Exhibition is the bandstand, which is Grade II listed. The Newcastle riverfront has been in use as a quayside since Roman times, when the first bridge was built over the Tyne. By the 16th century, many prominent merchants owned property in the area. Bessie Surtees house is one such example of Jacobean domestic architecture. It has a romantic past, being the scene of the elopement from a first floor window of Bessie Surtees with John Scott, later Lord Chancellor of England. The site of this medieval fortress has been in use for over 1800 years. During the 16th and 18th centuries the keep was used as a prison, and by the 1800s the fortress was home to a bustling community of slum housing, shops and taverns. Railway works in the 1840s saw much of the private housing demolished, leaving two imposing structures of The Keep and Black Gate and uncovering medieval remains underneath. The castle is now open to the public. A popular section of the Great North Run, in 2011 54,000 runners passed over the bridge, beating the record set by the Gothenburg Half Marathon as the World’s Largest Half Marathon. In preparation for the 2012 Summer Olympics, the largest Olympic rings in the UK were erected on the Tyne Bridge. At 25 metres wide and 12 metres tall, they set the scene for the Olympic torch relay in which adventurer Bear Grylls zip wired from the top of the arch to Gateshead quayside. Running alongside the Tyne Bridge, the Swing Bridge was built by the River Tyne Commission 1868-76 to expand trade in the North East. It was first used for road traffic on the 15th June 1876 and opened for river traffic on the 17th July that year. Up to the 31st December 1981 (the same year as the first Great North Run!) the Bridge had opened 286,281 times enabling 448,090 vessels of over 220 million total net tonnes to pass through. Today, the Bridge opens approximately 4 times per week. Opened in 2004 on the south bank of the River Tyne, Sage Gateshead is a landmark concert venue and centre for musical education. The curved glass and stainless steel design by Foster and Partners has won a number of awards and divided public opinion with some people drawing comparison to a large slug. The Sage has played a key part in Tyneside’s regeneration and can be seen as runners pass over the Tyne Bridge. The Baltic flour mill was a dual purpose factory from 1950 – 1981, producing flour and animal feed. Upon its closure the site lay derelict, until 1998 when construction began to produce a major new contemporary visual arts facility. Only the north and south facades of the original building remain in what is now home to BALTIC Centre for Contemporary Arts. Since 2002, over 190 exhibitions of work by 388 artists from 53 countries have been seen by more than 6 million visitors. This Victorian artillery piece is named for its experimental moving platform that allowed for the gun to be raised and lowered using air pressure pumps. It was installed around 1887 as an experiment but proved unsuccessful – it was too slow. It is now Grade II listed as a relic of late 19th century artillery development experiments, and can be visited by the public for free. 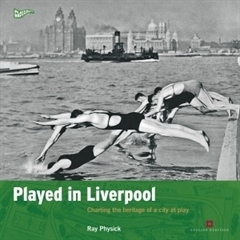 Discover your local sporting heritage with the Played in Britain series. Blog readers get a massive 25% off – use code SPORT17 at the checkout.